There is a legendary roller coaster out there unlike any you will ever find inside of an amusement park. This roller coaster ride typically lasts anywhere from 15-20 minutes, has a high point of 1962 feet, is a total of 11.1 miles long and includes some 318 unique turns. In the past 15 years, it has claimed at least 30 lives, yet it remains to date one of the most popular thrill rides anywhere in the United States, drawing people from all over the country to experience it. The challenges are unequalled and the price of admission is nerve, skill and a healthy dose of good luck. It helps to have a fast car too. 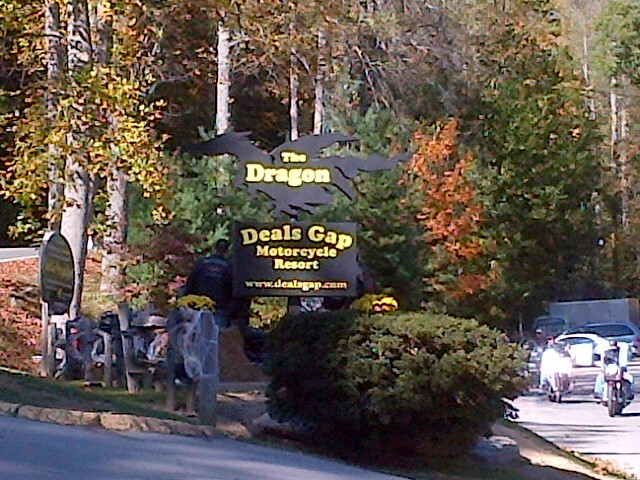 This is the Tail of the Dragon and you will respect it or you just might not live to tell about it. I’ve never been a big fan of roller coasters. I’ve ridden a number of them of at Six Flags over Georgia during my life but I never could get past being strapped into a moving device that hurls you up and down hills, around sharp curves and in some cases, upside down without having any control whatsoever. It’s much the same with airplanes I guess. You are less likely to die in an airplane crash than in a car crash, yet each day millions of us get in our cars without an ounce of worry that we might die because we feel like we have some measure of control and that our lives are in our own hands, even if we stand a greater chance of perishing with the wheel firmly in our grip. The roller coaster I’m talking about is different because unlike the others, you are very much in control and believe me, you had better be. US Highway 129 is 582 miles long and it runs from Florida through Georgia, North Carolina and Tennessee. It is an otherwise unremarkable highway except for one particular section of road known as the “Tail of the Dragon” (or to some, just “The Dragon”) because the road has so many curves and curls that it bears a passing resemblance to the tail of the mythical creature it gets its name from. From its location high in the mountains along the border of North Carolina and Tennessee, it calls out to drivers of all ages, daring them to come and “Run the Dragon” …and come they do, arriving daily to answer the call. They come on motorcycles such as Harley Davidson, Honda Valkyries and the high-powered “crotch rockets”, built for speed and handling. They come in roadsters such as the Mazda Miata, the BMW Z3/Z4 and the Porsche Boxster. They come in the high performance sports cars such as the Corvette, the Mustang and the Camaro. They even come in minivans, sedans, sport utility vehicles and everything imaginable, adding quite a few interesting variables to the fun. All this and more can be seen on the Dragon. 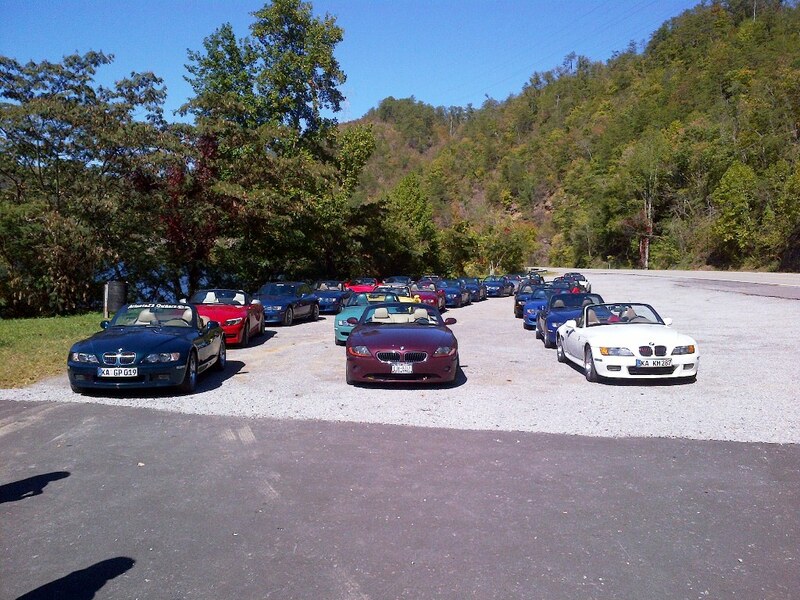 This past weekend, I attended my sixth annual “Ken’s Fall Color Drive”, a fun weekend held each October in Maggie Valley, North Carolina for driving enthusiasts of the BMW Z3 and Z4 persuasion. 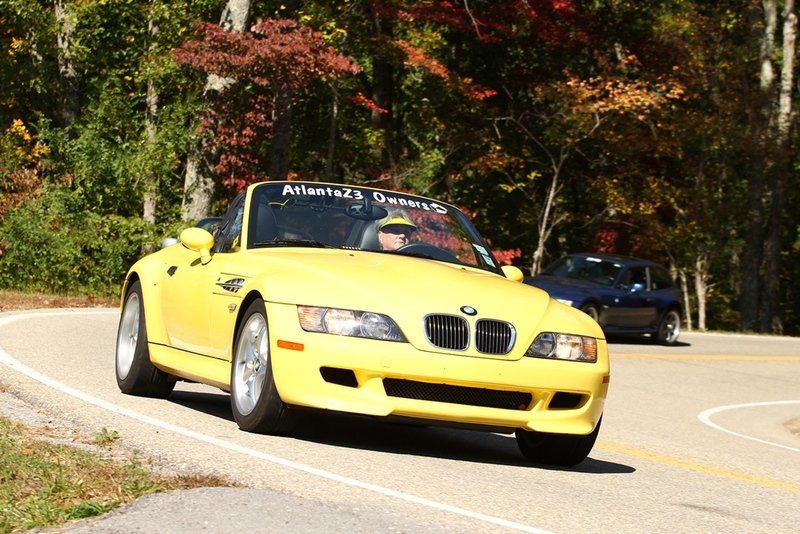 Although it is coordinated by the Atlanta Z3 Owners club, it is open to anyone with a BMW Z series car and draws drivers from all over the southeast as well as parts north and west of here. 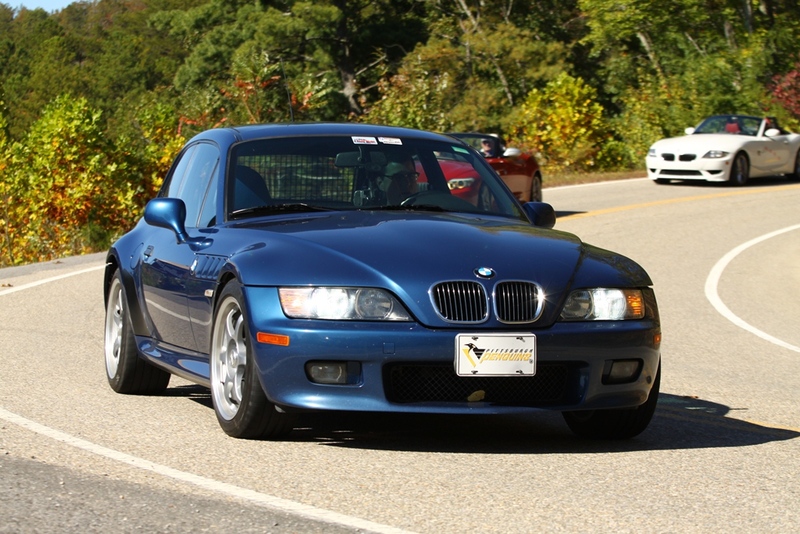 It affords two opportunities to participants: fellowship with fellow BMW Z car enthusiasts and an all-day drive through beautiful, sometimes tricky mountain roads decked out in the brightest colors of fall. Each year the drive route is different and covers different territory but at least once every few years, the Dragon makes its way on this list. It seemed, at least for BMW Z purposes, that 2011 would be the “Year of the Dragon”. We had spent the morning of October 15th driving and had already racked up about 125 miles of mountain road driving, beginning with the Blue Ridge Parkway and moving on to some more moderately difficult roads with less traffic and more challenges. We travelled from just north of Cherokee to just south of Gatlinburg before we detoured through Cades Cove and on to Maryville, Tennessee where we gathered for lunch. Thirty cars, divided up into two groups spaced apart by about 15 minutes travelled this way, becoming re-acquainted with the roads and the driving dynamics of the cars. This was important because many of the drivers live in urban areas and might only get to drive their cars on twisty mountain roads once a year and you don’t want to tackle the Dragon until you and the car have had some quality bonding time on these roads. 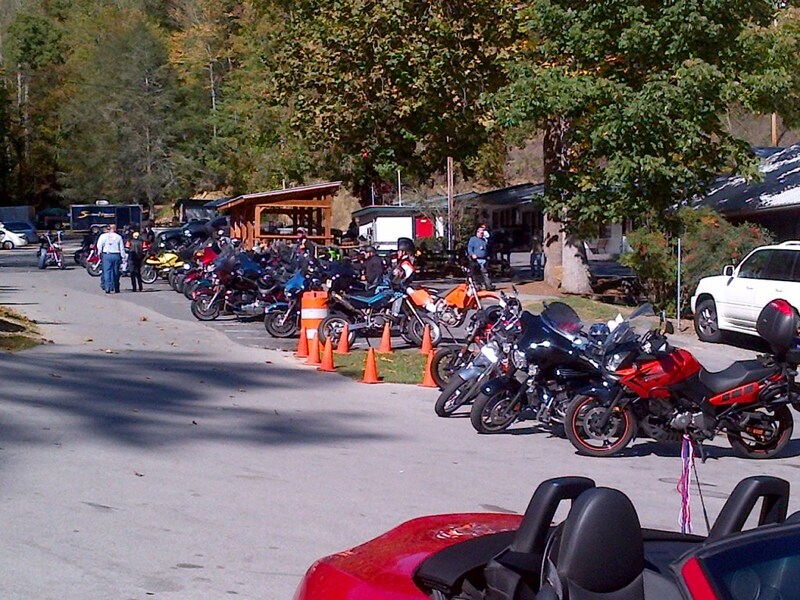 After the morning drive and lunch, we hit a few more roads, making our way towards US 129 where we stopped at a large pull-off along Chilhowee Lake for a short bathroom break and to wait for the second group to join up with us. This would be my second time driving the Dragon but the first time hadn’t been a lot of fun because on that drive, two years earlier, it was raining and foggy and we had to poke our way down from Deal’s Gap at the top to the bottom. Wet pavement, fog and slippery leaves make the Dragon unsafe at any speed. This time would be different though….the sky was clear, the road, dry, the temperature, low 60’s and to make matters more fun, we would be running up the Dragon, which is definitely the way to go. There was one more order of business to take care of and we gathered around as Greg, who coordinates Fall Drive each year, gave us some last-minute instructions. “This is the Tail of the Dragon” he said with all the seriousness of a drill sergeant about to brief his troops on an impending assault. “Eleven miles, three hundred and eighteen curves. Few pull-offs, less guard rails”. Everyone was quiet as he continued, adding “Your real estate is between the white line and the double yellow line. You do not cross the white line or the double yellow line. People get killed on this every year. Be safe, be responsible and remember, if you have a wreck, you signed a waiver”. His last line and the smattering of laughter that accompanied it broke a little of the tension in the air, for it was a bit tense. You don’t just casually go and “drive the Dragon” like you are going to the supermarket. You know you are about to drive a road that will test your skill as a driver and one that is not at all forgiving. First mistakes on the Dragon can be last mistakes. You not only have to worry about your own driving skill but the skill of every vehicle you encounter on the road. They are depending on you to keep your lane just as you are depending on them to keep theirs. You run over the yellow lines and you risk a head on collision. You run over the white line and you risk rolling down the side of a mountain in many places. Risk sits in the passenger seat with you. All this goes through your head as you mentally prepare to charge up the mountain. As we finished up at the lakeside stop, we noted the number of motorcycles we saw coming and going by us, interspersed with fast sports cars and other, slower vehicles. It was going to be crowded on the Dragon today. Greg told us that rather than going up in one big group, which would surely end up bogging things down, that we could go as we wished to. The faster drivers who were more experienced driving the vehicles should go first and get a good head start and the inexperienced drivers or those who wished to travel at a more leisurely pace should go later so as not to hold others up. Everyone would congregate at Deal’s Gap on the top of the mountain. The first one out was a red “M” series Z4, driven by one of the oldest members of the group. He was gone in a flash and soon others joined him. I waited a minute or so for the serious hot-rod drivers to go (my mother in her bright yellow “M” series Z3 being one of them) and then I fired up the dark blue Z3 coupe that was mine to drive for this weekend, listening to the harmonious sounds of a precision engineered motor at idle. I’ve driven this car on two other drives, a spring and a fall drive and I know it very well. I know that it has been meticulously maintained by Greg himself, an aviation mechanic who just happens to know every intimate detail of the Z series cars and could fix one in his sleep. Good maintenance is important since the newest Z3 in the entire bunch is at least nine years old, the last year of that model. I know it has a brand new set of very good tires on it and since I’ve already driven it over a variety of mountain roads that morning, I’m in tune with it. Time to go. I head out onto the highway as it runs along Chilhowee Lake, the car running smoothly, tires humming and spectacular fall colors painting the mountains that surround the clear blue waters. The scene is peaceful and beautiful as I cross Tabcat Bridge but once past it, my full attention must now be focused on the road. The Dragon begins here. A short distance in, I spot a clearing on the side of the road populated by two familiar sites on the Dragon….a photographer and a state patrol officer. Photographers are set up at strategic points all along the route to take photographs of you driving the Dragon, which you can later go online and purchase. They are unobtrusive and well out-of-the-way of drivers but they have excellent vantage points to get good shots of you with their high-power, rapid shoot lens. The highway patrol is there to make sure people behave and don’t get overly crazy. If you get irresponsible or go too fast, they will get you and the fine will be steeper than the hills you are driving. Fortunately, he was the only one I saw, although I knew it was likely there were others on the road in unmarked vehicles. After the clearing, the fun began….curves, both of the sharp hairpin kind and of the more leisurely kind, switchbacks and inclines, they all throw themselves at you one right after the other. The undulating road has few straight parts and even those seem to follow the contours of the mountain as you dip and steer slightly left, then rise, nudging the wheel to the right, then dip to the left again in rapid succession. Gearing up and down is a must to get the most out of the drive and if you are riding with the top down or the windows open, you will hear the sonorously pleasing sounds of motors as they gear down on inclines, then accelerate up the next one. In many cases, you can find the perfect gear for this type of driving and leave it there for several turns before the next hill kicks in and forces a gear change. The driving dynamics of the BMW roadsters is such that there aren’t any curves on this road that the car can’t handle with ease by a driver with experience but you have to remember what Greg said about the “real estate” because what is coming down the mountain toward you is another story. I passed almost everything imaginable. Motorcycles were the predominant ones. You don’t have to tell the Harley owners how to drive the Dragon….they know how….but the occasional teenager on the sport cycles are some you really have to watch for because they are trying to see how fast they can go…and sometimes they will even pass drivers in front of them, rocketing between the cars going up and down the mountain. The majority of fatalities on the Dragon seem to include these types. You also have to keep in mind that the road itself presents new obstacles every year. The pavement is a little rough in places and the type of winter weather than happens each year in the higher elevations takes a harsh toll on the road. Patched places are frequent and cracks form weekly, sometimes resulting in potholes. Hillsides that the road clings to can sometimes dislodge rocks and pebbles that can be tricky for cars and downright dangerous for motorcycles to navigate through and then you have the locals such as deer, wild turkeys and the occasional bear that might wander into the road. All of this has to be taken into consideration when you are taking on the Dragon. Many of the curves I mentioned literally hug the side of the mountain and you can’t see what is coming around on the other side…..a group of Smart cars riding in formation were enjoying the day too….a Corvette and a Porsche playing with the curves….a Fiat 500…lots of Volkswagen New Beetles….Mini Coopers twisting through the curves like they were on rails….a group of heavily customized Honda Civics, rebuilt for speed and handling….I saw all of them. Fortunately what I did not see that day was a tractor-trailer because keep in mind that this road IS a U.S. highway and they have the right to use it too-they just cannot always keep to their lane the way a car can. We met just about everything as our group travelled the Dragon and happily, we all emerged unscathed at the other end some 15-18 minutes after we had started. It felt like a five-minute ride to be honest. I found as I arrived at the Crossroads of Time, the world-famous biker lodge and store at the top of Deal’s Gap, that I felt a mixture of both relief and exhilaration. Driving the Dragon is as much an adrenaline rush for drivers as jumping out of an airplane might be for a parachute jumper. As the others arrived, we headed over to the store, which was surrounded by at least 100 motorcycles and sports cars of all kinds, to check out the variety of souvenirs and more importantly, so that first time drivers could buy their official “Tail of the Dragon” sticker to put on their window, a badge of honor recognized all over by driving enthusiasts of every kind. Legend has it that if you buy the sticker and put it on your vehicle before you drive the Dragon, that you won’t complete it. I don’t know how true that legend is but I don’t know many willing to risk the wrath of the Dragon by testing that theory. The Tail of the Dragon is one of the most beautiful, scenic and unique experiences to be found for driving enthusiasts of all kinds but also one of the most challenging. For the BMW roadster folks, it’s a route that finds itself on our driving agenda quite often but one thing we all have learned and which we keep in mind is that you never truly tame the Dragon….you respect it always and if you do, you will experience the greatest roller coaster ride of your life. I simply adore twisty two-lane roads and was all for heading out there for a drive one day until I read about how sparingly guardrails were applied. Yeah, you’d see me driving the entire distance at 15 miles per hour. It would not be a pretty sight, all those cars piled up behind me honking. It can be done, I would just recommend doing it on a weekday and not on a Saturday when everyone has the same idea and destination in mind. The Blue Ridge Parkway is a lot safer and just as pretty though! I love that your mom does this drive and got you into it – you go, girl! Rode the Dragon in August of 2011 on a brand new Harley, Super Glide. Loved it! My friend Joe and i rode down from Wilkes-Barre, Pa. in one day, 760 miles. On the weekend it was busy, but I rode it again on a Monday evening and had it all to myself. Sweet!!! Also did the Cherohala Skyway, and Moonshine 28. Came home thru the Smokey Mountains. Beautiful ride!